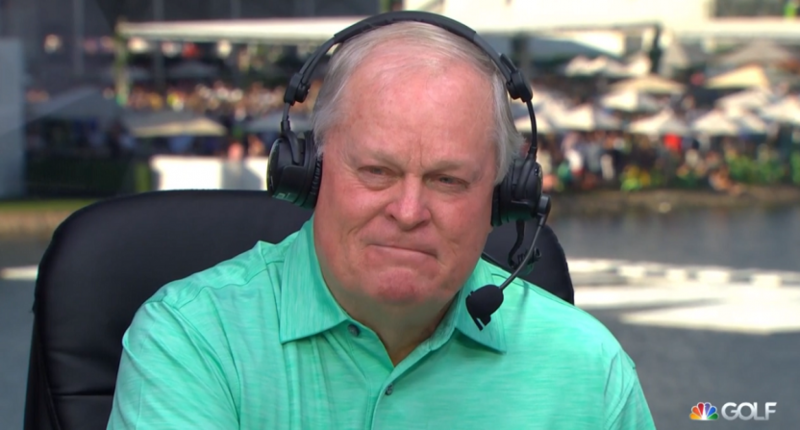 We’ve known since last fall that Johnny Miller would be stepping aside after nearly thirty years in the booth, during which he established himself as the defining voice of golf commentary. Today, though, was Miller’s last round in the booth, a special farewell day at the Waste Management Phoenix Open, an event Miller won twice in his playing days. (It’s an event that’s typically on CBS, but NBC has it during years CBS airs the Super Bowl, like this one.) The broadcast felt more like a tribute throughout, with various montages honoring Miller’s career as both a player and a broadcaster. But the very best part of the broadcast was Miller’s longtime broadcast partner Roger Maltbie, which NBC saved until the final group was in the 18th fairway. Maltbie: Johnny, a chance to speak from the heart. You’ve been a part of my life for as long as I can remember. When I was 12-13 you were 16-17, you were winning all the junior tournaments and I wanted to be like you. In ’66 at age 19, you played so great at the Olympic Club that all of the junior golfers in Northern California wanted to be like you…And then we got the chance to share golf’s greatest mulligan. I got to do this for 27 years with you. It is bittersweet. I am going to miss you. I hope you catch the biggest fish you ever caught in your life. And I hope you’re the grandpa you want to be. I’m going to miss you, buddy. Miller: It has been a pleasure. I appreciate all of the people out there. Tried to do a lot of my commentating for you out there. I’m glad you accepted my form of commentating which was not normal. It was a little bit rough at first but it has been a pleasure. The friendships I’ve made and the guys on our team that have been so amazingly good, and players out there that also feel pretty good about it. So, thank you. Miller has been a lightning rod for a very long time, disliked by players for his willingness to criticize in a sport traditionally covered with fairly soft gloves, disliked by fans for his borderline curmudgeonly negativity. But what Johnny did bring was a lack of filter that lead to interesting television, and a great work ethic he carried over from his playing career. He may not have always been right, and some of his takes (especially in recent years) were pretty out there, but he did his homework every week. Johnny Miller never changed, and that’s what made him great.